Delta. H2Okinetic. Showers look different because they are different. Using advanced technology, H2Okinetic showers sculpt water into a unique wave pattern, giving you 3X the coverage of a standard shower head. * The end result is a shower that provides more coverage, more warmth and more intensity for a truly drenching shower experience. With separate handles for volume and temperature control, this Delta tub/shower provides a more refined showering experience. Simply set the water at your preferred temperature and turn the shower on or off with the volume control handle - without interrupting your set temperature. Delta. pressure-balance valves use Monitor. Technology to protect you and your family from sudden temperature changes. This Brilliance Stainless finish has subtle, warm undertones which make it an excellent match with nickel or stainless steel and is extremely versatile, complementing nearly any look, be it traditional, transitional or contemporary. While other products may gather unsightly mineral build-up over time, Delta soft rubber Touch-Clean. spray holes allow any mineral residue to simply be wiped away for an instantly refreshed look with no need for soaking or the aid of chemical cleaners. Delta. pressure-balance valves use Monitor. Technology to protect you and your family from sudden temperature changes. Chrome has rapidly become one of the most popular finishes across dicor styles in the bath thanks to its stunning gloss and innate versatility. Paired with crisp lines and bright whites, it creates a bold, modern contrast, but it works equally well with vintage styles and traditional spaces to convey a hint of nostalgia. Delta WaterSense labelled faucets, showers and toilets use at least 20% less water than the industry standardsaving you money without compromising performance. Complete your bath with a beautifully designed Delta roman tub faucet, meticulously crafted to turn heads and enhance your experience. The included hand shower makes this a versatile addition to your bath, perfect for rinsing off, washing loved ones and pets or keeping your tub clean. Matte Black makes a statement in your space, cultivating a sophisticated air and coordinating flawlessly with most other fixtures and accents. With bright tones, Matte Black is undeniably modern with a strong contrast, but it can complement traditional or transitional spaces just as well when paired against warm nuetrals for a rustic feel akin to cast iron. You can install with confidence, knowing that Delta faucets are backed by our Lifetime Limited Warranty. 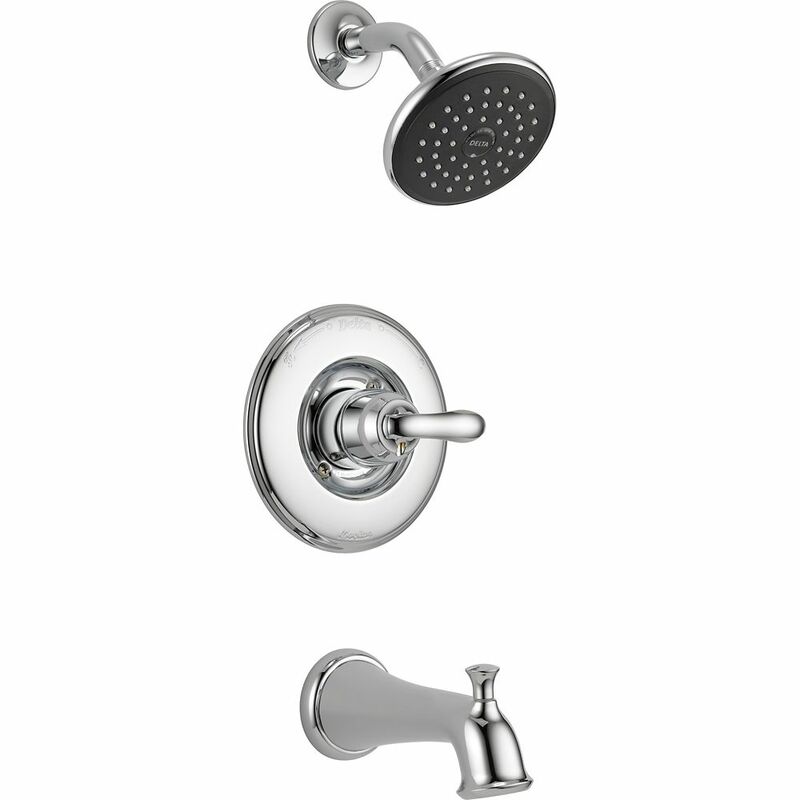 Linden Monitor 14 Series Tub and Shower Trim, Chrome Delta<sup></sup>'s separate rough and trim program allows you to switch your trim without the hassle of changing your rough-in as well. Another great benefit is the ability to have your plumber install the rough-in before you've decided on the trim you want. By installing the rough-in first, you can later decide what type of trim will go perfectly in your bath. Linden Monitor 14 Series Tub and Shower Trim, Chrome is rated 3.8 out of 5 by 18. Rated 4 out of 5 by Rich from Did not come with tightening nut to hold cartridge in. had to modify old nut. Did not come with tightening nut to hold cartridge in. had to modify old nut. Rated 3 out of 5 by Tone from Looks great We recently remodeled our bathroom and we selected the Linden set because of how great it looks. It looks as good in person as it does in the pictures. I am giving it only 3 stars because of how slow the water pressure is compared to my previous shower head. If the shower head pressure could be increased, i would definitely give this a higher rating. Rated 5 out of 5 by Paul123 from Great product Love the product and performance! More specifically the faucets look awesome.